Today we drove once again to Hamburg but this time not because of another visit at the Zoo but for our little boy’s baptism. 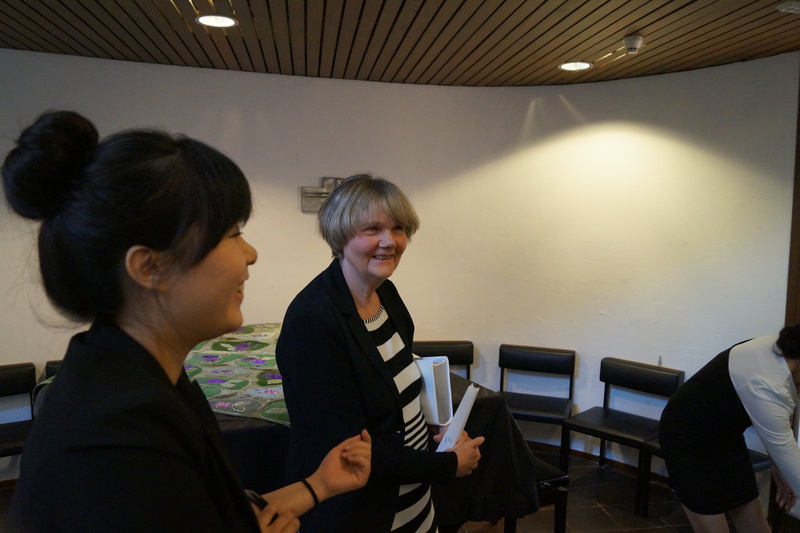 We chose a little church in Hamburg because I was myself baptized in that church nearly 27 years ago. Back in the day my parents decided on that church because it is the Finnish Seamen’s Church and I am myself 1/2 Finn and 1/2 German. 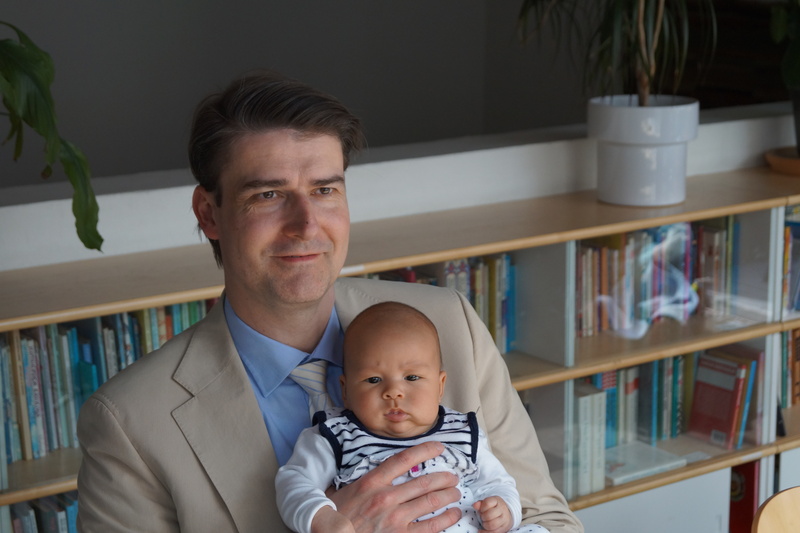 Now that our little son was born we thought it was just right that he would be baptized in the very same church as me and besides he is also to part Finnish! 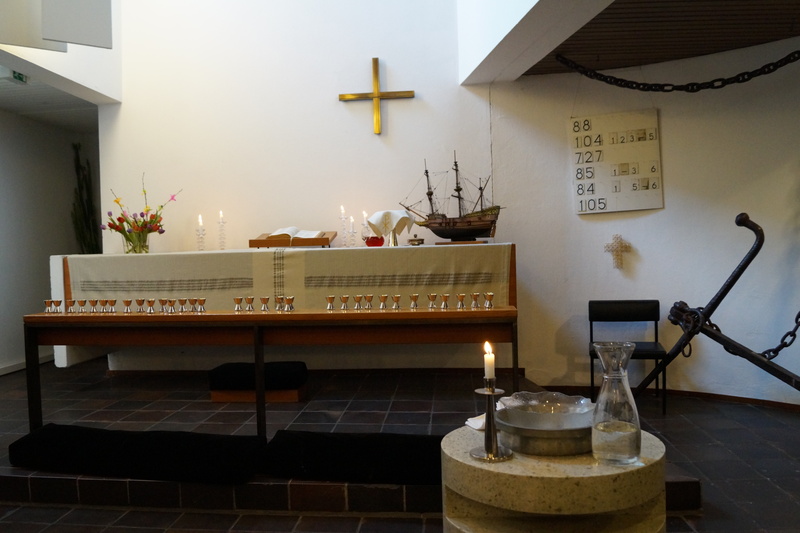 The church was built at Ditmar-Koel-Strasse 6 in 1966, in the same street are also the Norwegian, Swedish and Danish Seamen Churches (sorry if I forgot other churches but I never paid too much attention which other ones are located there). Seamen’s church indeed, an anchor and a model of a ship inside! After the service was done we left the church and went to the coffee shop in the same building. My parents had a little cold bread table ordered so we had time to relax a bit with coffee/tea, bread, pulla and some muffins. It probably does not sound like a very exciting day but we liked it as we prefer to keep things simple and it was an excellent way to get body and mind away from the ever going on renovation work in our apartment. Besides, it was very nice that everything went so smooth this day as we had some little drama the two weeks prior to the baptism as one of the papers necessary for the process was missing. Not any paper but the BIRTH CERTIFICATE itself vanished somehow so we had to get some certified paper from the Finnish resident registration office asap to Germany which was not as easy as it sounds now but in the end we managed everything just fine and the pastor received all necessary documents couple of days before the deadline. Congrats to Nathan on his baptism! 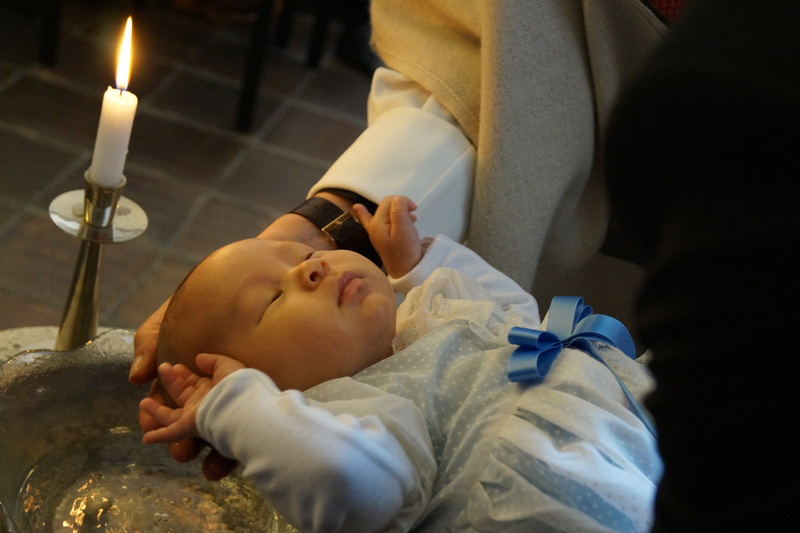 I know a lot of babies get baptized around this time in Canada as well (in accordance with Easter)! Your bundle of joy is very cute, especially in the first picture – a framer for sure! Congrats to Nathan! Thanks for sharing about his baptism, it’s something I’m not too familiar with. From the sounds of it, it seems like a low-key ceremony and glad everything went off without a hitch. It doesn’t seem like a ceremony where you’d invite a ton of family and friends, though, just the closest ones (I could be entirely wrong, but rarely do I hear people talking about baptisms as a significant life event, which I’m sure in a way it is). Hope all is going well with the renovations and your new family home is coming together nicely. I believe it always depends on the family whether to invite many people or to keep it very simple. Congrats to Nathan 😀 The photos are great, seems like you and your family had a great day~ My family (including uncle and aunts) also had very “simple” baptisms for my cousins and my younger siblings 🙂 Actually my mum said the other day that now she’s just waiting for me to get pregnant so she can plan the whole “party” afterwards, while I told her that I prefer the “low key” parties 😛 haha.. I came across via Madh Mama’s guest post on your love story. I think she can guess that I must have some kind of blog and it would not even surprise me that she might have some weirdo micro blog account writing about her crazy son-in-law. There are just so many things to write about and I try to minimize it already to really strange things but this is also hard because most things are usually too strange to be true what she is doing..